When Trainspotting first hit our shelves back in the early Britpop days of 1993, it was part of a wave of frighteningly accurate portrayals of Heroin addiction (see Robert O’Connor’s Buffalo Soldiers and Edward St Aubyn’s Bad News). Yet while the popularity of those books has waxed and waned over the intervening 2 decades, Trainspotting has maintained its punk, cool swagger and an ability to lark, shock and sicken in equal measure – helped undoubtedly by a fantastically successful film adaptation. In Your Face & King’s Head Theatre’s interpretation adds to this legacy with a reimaging that takes all that the original does well and throws in nods to Danny Boyle’s film, while still keeping it fresh by providing some new material to the mix too. Aptly staged in the tunnels under Temple Meads station it’s a fully 4D experience throughout, that shows how the tale still has lost none of its potency to appal audiences. As you first walk into the venue we are greeted by blaring dance floor fillers, dry ice, glow sticks and strobe lighting so powerful as to induce instant euphoria. If you strain your eyes you can well imagine you’ve stumbled onto the sticky killing floor of Bagley’s in its E-fuelled heyday. Making your way to your seat is quite an experience, as you are jostled by the cast, who gyrate around you like you’re the last single person on the dance floor just before the lights come up. Then the lights do come up and we are thrust into Renton’s infamous “Choose Life” soliloquy. The visceral nature of the evening continues through many of the books centrepiece moments, as the actors effortlessly segue from performance to internal monologue and back without so much as a pause or hesitation. Although a very grim tale, all Welsh’s dark humour is retained, and is expertly exploited by the cast. 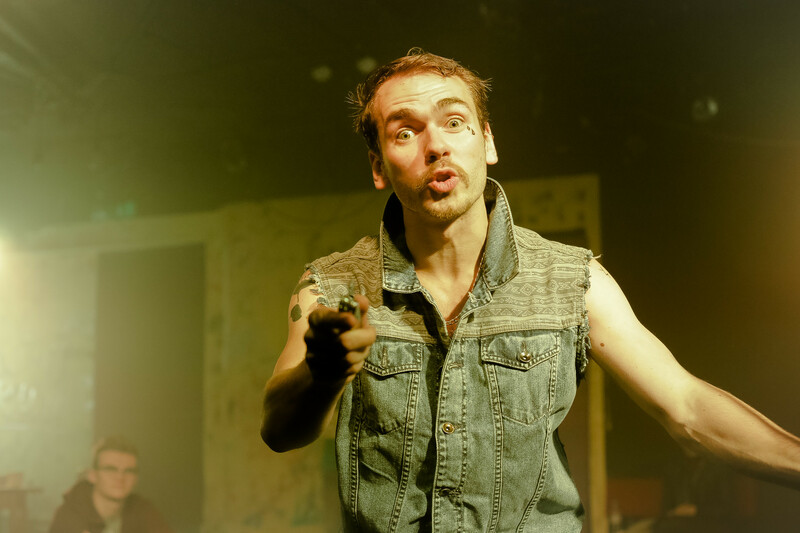 Their comedic timing is spot on, especially when Sickboy (here played by the excellent Rory Speed) attempts to pull a member of the audience up to dance only to be soundly rebuffed. Bemused he carry’s on, but as he leaves the stage he gives the lady in question a sly look and quips “I’ll see you afterward doll”, to much amusement amongst the crowd. The actors here are certainly encouraged to engage with their audience as they clamber over and through them, all along physically cajoling them with little regard for their Victorian morals. It draws a mix of confused laughter and sheer terror, especially when the terrifying Begbie is stalking the stage like a rabid wolf. His mouth salivating, as he spies all the easy prey of the front row, Begbie scowls at us all with complete and utter contempt. The raging physicality and fury that Chris Dennis brings to the role is truly chilling. Indeed, Dennis’ Begbie is possibly the most intimidating iteration of the character this writer has ever encountered. Every threatened beating is met with cowered terror. Every choreographed punch on stage is met with an empathetic wince as if the blow was meeting with our own flesh. Every pause for a laugh is met with obsequious laughter. Perhaps the biggest feather in the cap for directors Adam Spreadbury-Maher and Greg Esplin is that they have so accurately captured the very essence of the original setting. From the Hummel tracksuit tops to the authenticity of the barely decipherable Edinburgh dialect (so thick it drips from their tongues like treacle), all the pageantry of the gurning zombification that encapsulated the “lad” generation is here again. For those who were there, both as participants and observers, it simply adds to the totality of the wonderful experience. 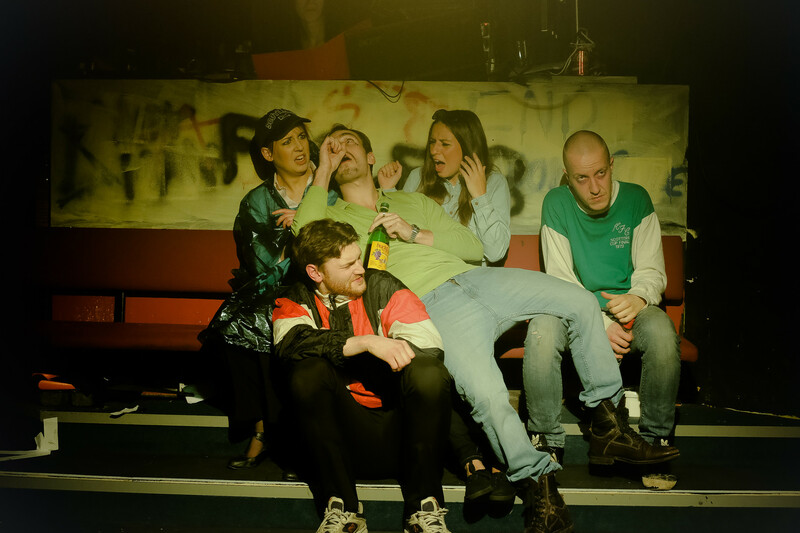 Flying faeces, domestic violence, tragedy and more 90’s dance tracks than Mike Pickering could dish out at the Hacienda – In your Face & King’s Head Theatre’s production of Irvine Welsh’s classic submerges you in all the filth of the original in a truly visceral and immersive experience. To get tickets just click here. Tagged 2016, april, bristol, Kevin Mcgough, loco club, review, temple meads, the fix, the fix magazine, theatre, tobacco factory, trainspotting, tunnels, whats on. Bookmark the permalink.